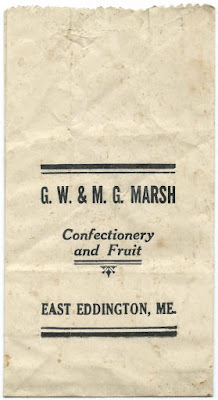 Small paper bag from the confectionery and fruit business of George W. Marsh and son Matthew George Marsh of East Eddington, Maine. The 1930 Census of Eddington notes that the Marsh family lived on Main Road; I assume their grocery store was also located there. George W. Marsh was born in Maine in 1854, son of Rev. Leonard Marsh and, I think, his second wife, Mary Betsey, unless Mary and Betsey were two different women. Rev. Marsh, a shoemaker and clergyman, was born at Fredericton, New Brunswick, on December 20, 1809; he lived in several towns in Maine, presumably following church openings. 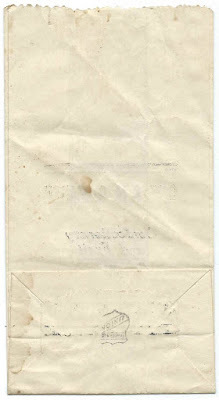 He had to have been married at least three times, as his first wife, Rebecca Ann, died in 1845, before George was born. He married late in life, in 1892, to Mary Silsby (Frost) Moore, widow of Benjamin Franklin Moore. It's the middle portion of Rev. Marsh's life that has eluded me. The 1860 Census of the town of Monroe, Maine, shows Rev. Marsh's wife as Betsey, born about 1822 in New Brunswick. Another clue is a headstone for Mrs. Mary Marsh, wife of Rev. Leonard Marsh, at the Pine Tree Cemetery at Eddington, Maine, where many members of the Marsh family are buried, including George and Matthew. 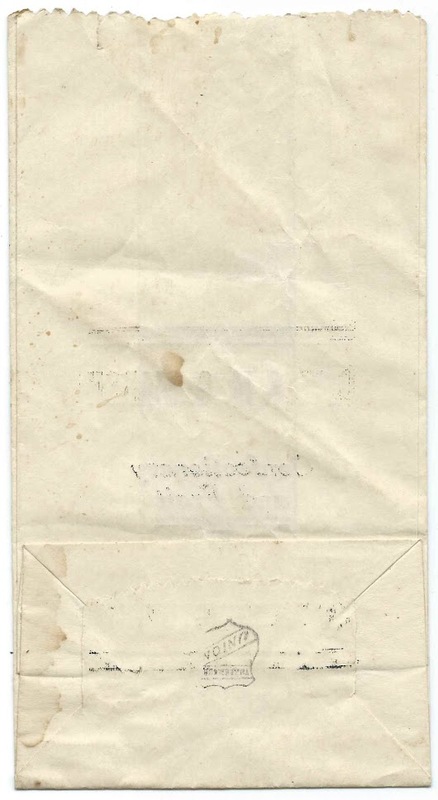 The stone notes that Mary died in 1891, with her age given as 73 years and 7 months, which would put her birth year as around 1818. Again, were Betsey and Mary the same person or did Mary succeed Betsey as Rev. Marsh's wife? George W. Marsh married twice: 1) Martha J. Spencer in 1872 - she died in 1886; and 2) Lizzie M. Spencer in 1890. Martha and Lizzie may have the daughters of Ebenezer and Elizabeth G. (Orcutt) Spencer. The Spencer and Marsh families lived near each other near the border of Penobscot and Hancock counties. Matthew George Marsh was March 2, 1886, according to his World War I draft registration card, but 1885 according to his gravestone. It seems likely that his mother was Martha J. (Spencer) Marsh, who may have died in childbirth. I don't believe Matthew married. George died in 1938 and Matthew in 1940; as noted above, they are buried with family members in the Pine Tree Cemetery at Eddington, Maine. There's a sad account about George's half-brother, John B. Marsh, in Incidents Among Shot and Shell: The Only Authentic Work Extant Giving the Many Tragic and Touching Incidents that Came Under the Notice of the United States Christian, published in 1868. John was living in the South when the Civil War broke out and was conscripted into the Confederate Army. He was executed after trying to desert. 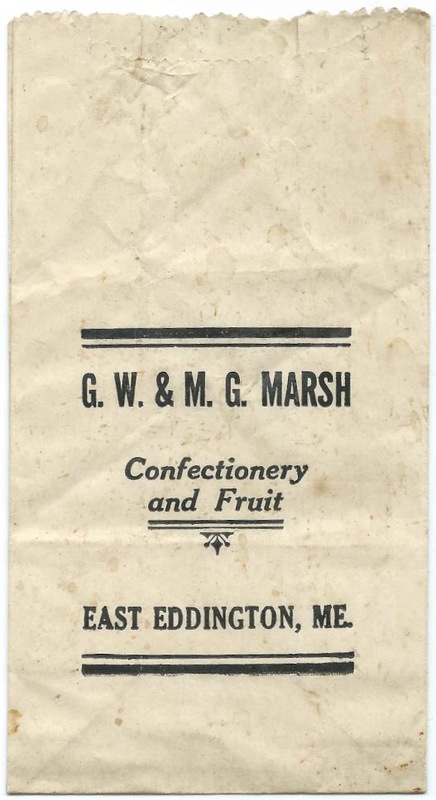 If you have corrections to the information above, or memories of the store that the Marsh father and son operated, please leave a comment or contact me directly.